This special package includes our world famous keeper chastity belt, and a full stainless steel body harness. 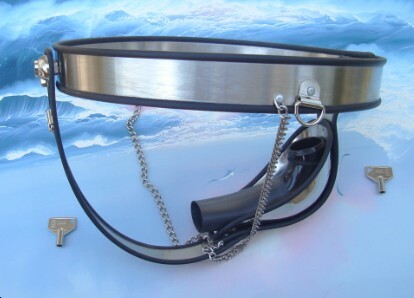 The body harness is made of 24 ga. x 1 1/2" wide stainless steel. The stainless steel is covered with a strong clear vinyl casing in the front with a black vinyl backing. There are D-rings all over this body harness. Too many to count. The body harness locks around the chest and stomach. 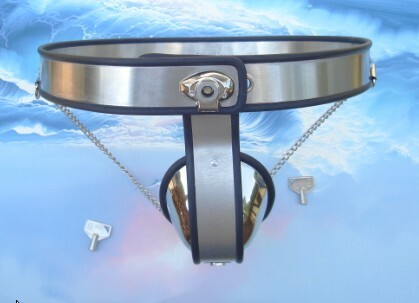 Once the chest and stomach portion is locked, the harness is than locked around the waist to the keeper chastity belt. This way it is impossible to remove the harness or the chastity belt. Both items are quality made in the USA! Please click on the link below to view a video which explains how to take measurements for the body harness. View video for measurements.